The Murrell Home was built in 1845, for Minerva Murrell daughter of Cherokee treasurer Lewis Ross and niece to Chief John Ross. It is the only remaining antebellum plantation mansion in the state of Oklahoma. The 800-acre plantation was operated by George Murrell, a Virginian merchant and husband of Minerva. In addition to the mansion, smokehouse, and springhouse, Murrell also had a mercantile store, blacksmith shop, barn, stables, a grain mill, and other buildings on the property. Today, the historic site strives to interpret the workings of the original Cherokee plantation, complete with gardens, field crops, orchards, and other agricultural features. 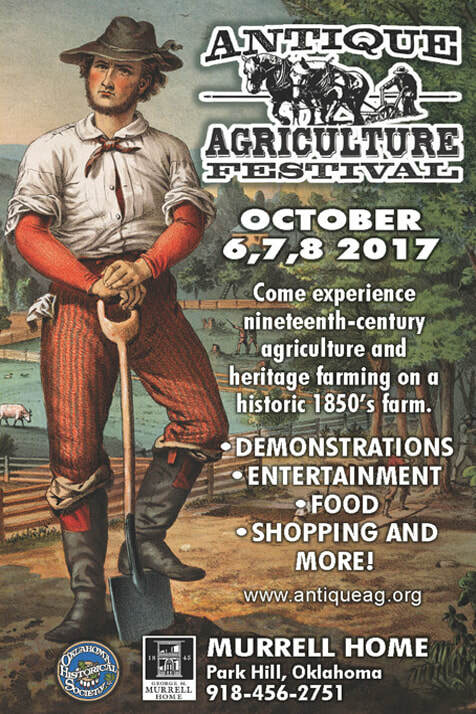 As you visit the Antique Agriculture Festival, note that all of the living history activities date to the pre-Civil War period. Our animals, for example, are used for doing work on the plantation. Although visitors are encouraged to look and ask questions, the animals are not pets, and we ask that our guests respect the work that these animals will be doing. You'll see antique farm implements used to cultivate corn, wheat, and hay. Also note that we don't have any mechanized vehicles! A trip to the Antique Agriculture Festival will transform you back in time to antebellum Indian Territory. For a full history of the Murrell Home Historic Site, please visit our website at www.okhistory.org/murrellhome. The Antique Agriculture Festival and all of the Murrell Home's programs are made possible through the support of visitors like you. We encourage you to donate online, or to become a member of the Friends of the Murrell Home.